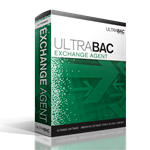 The UltraBac Exchange Agent allows local and remote backups of live, operational databases without shut down. This is a required UltraBac option for 7x24 operation. The agent uses Microsoft Exchange APIs for fast and reliable full & incremental database dumps. Protects Exchange 2013, 2010, and 2007 with VSS support, as well as Exchange 2003. Also provides SMTP email notification.